A Nazi-looted painting that was returned to a Montreal family after being found in the collection of an Austrian museum goes up for auction Wednesday in New York. 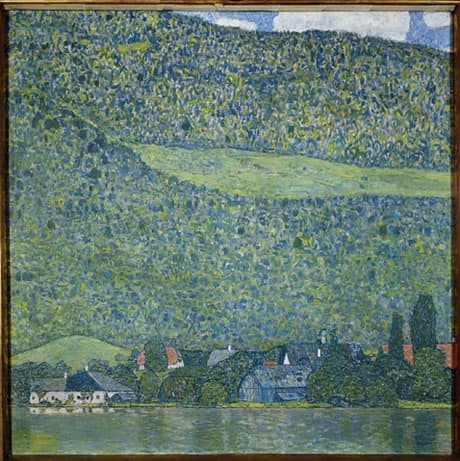 The Gustav Klimt painting Litzlberg am Attersee (Litzlberg on the Attersee) is valued at $25 million US by Sotheby’s auction house. It was returned in July to to 83-year-old Georges Jorisch of Montreal, a retired camera storeowner and grandson of Amalie Redlich, the Austrian Jew who once owned it. Klimt painted the peaceful lake scene was painted in 1915. He sold it to Austrian iron magnate Viktor Zuckerkandl and his wife, Paula, who were art collectors. They died childless and part of their collection, including Litzlberg am Attersee, passed to Viktor's sister, Amalie Redlich. In 1941, Redlich was deported to Lodz, Poland, by the Nazis and never heard from again. The Gestapo seized her collection and the Klimt resurfaced three years later in the collection of the Landesgalerie Salzburg. It later moved to the Salzburg Museum of Modern Art. Jorisch has reached an agreement to split the proceeds of the sale of the painting with the Salzburg museum. "Klimt's landscapes are now considered to be one of the great icons of modern art," Simon Shaw, Sotheby's New York head of impressionist and modern art, told Reuters. "They are one of the most recognizable images and their appeal is truly a global one." The view of Lake Attersee was painted in the place where the Austrian artist usually spent his summers. The Salzburg city government struck a 2002 accord struck with Jewish organizations to return assets stolen by the Nazis, in the wake of 1998 restitution law by Austria.